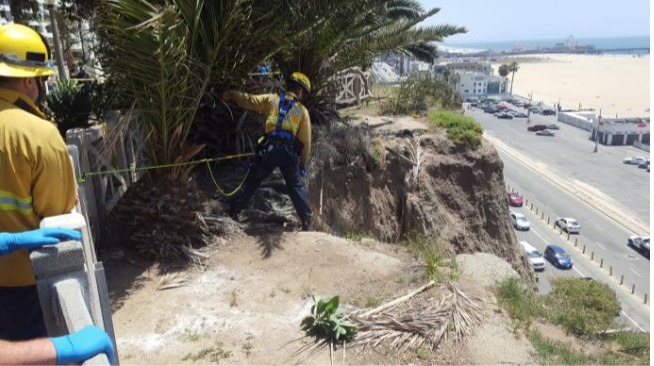 On Monday May 7th, 2018 at 12:33 p.m. Santa Monica Firefighters responded to the 1100 block of Ocean Avenue for a report of a person trapped mid-way down the Santa Monica bluffs overlooking the Pacific Coast Highway. Initial arriving units spotted the man approximately 30 feet down from the top located in a precarious portion of the extremely steep hillside. Members of the SMFD’s Urban Search & Rescue team quickly established a high-angle rope rescue system to lower a rescuer down to the victim in order to secure him and prevent him from falling. It took 20 Firefighters approximately 32 minutes from the initial 911 calls to when the victim was safely extricated from the hillside. The victim was a male in his late 20’s who was evaluated by Paramedics and taken into custody by Santa Monica Police Officers.